Prime Minister Benjamin Netanyahu on Wednesday night welcomed a decision by the Czech Republic to set plans in motion to move the country’s diplomatic missions from Tel Aviv to Jerusalem. 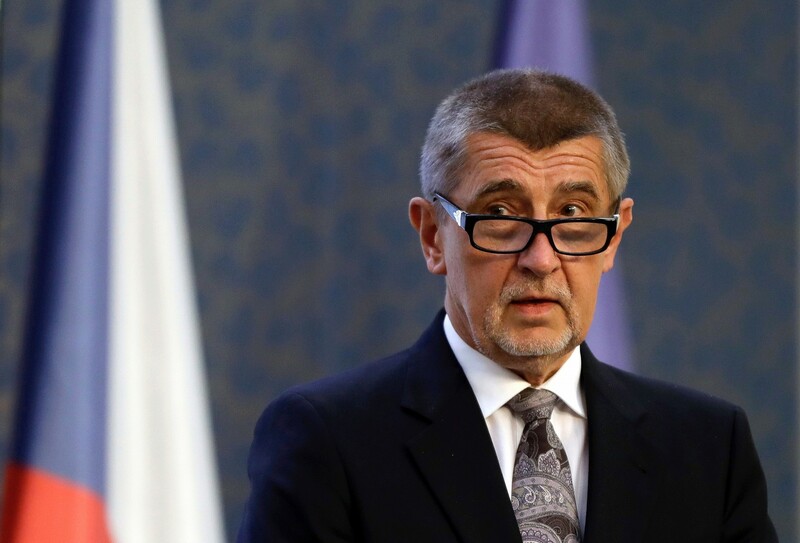 While it remains unclear if and when Prague will actually open an embassy in the holy city, the prime minister expressed hope the embassy would be relocated to the capital, and quickly. 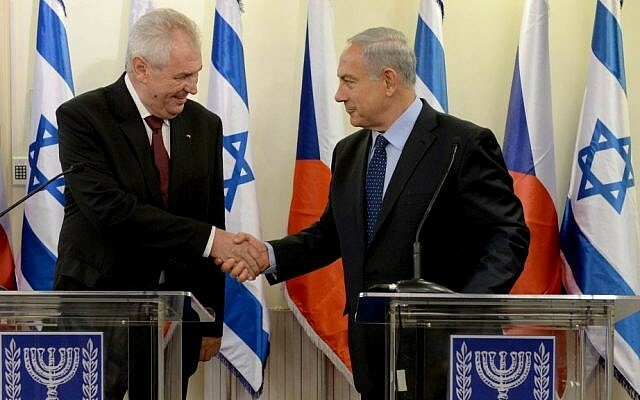 “‏I thank my good friend, Czech President Miloš Zeman, for the important declaration that the Czech embassy will move to Jerusalem. I hope that the decision will be implemented quickly. I look forward to welcoming President Zeman here in Israel with the great respect that he deserves,” Netanyahu wrote on Facebook. 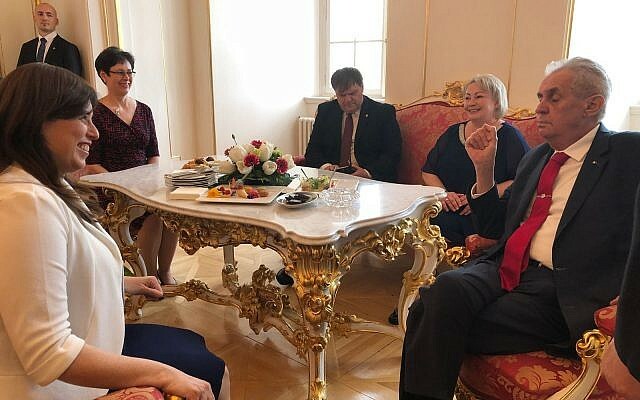 President Miloš Zeman announced the three-staged move, which starts next month with the appointment of an honorary consul in Jerusalem and is to conclude at an undetermined time with the relocation of the embassy. “There will be, I hope, three phases of removal of the Czech embassy from Tel Aviv to Jerusalem,” Zeman said at an event in honor of Israel’s 70th Independence Day at Prague Castle — the first-ever celebration of another country’s anniversary held at the site. “The second phase, well, we have many, many institutions: Czech Invest, Czech Trade, Czech Tourism, Czech Center. And all those institutions are to be transferred from Tel Aviv to Jerusalem,” he said. The actual embassy move would be the third stage. Czech President Miloš Zeman (R) meets with Israeli Deputy Foreign Minister Tzipi Hotovely (L) at an event in honor of Israel’s 70th Independence Day at Prague Castle on April 25, 2018. On December 6, US President Donald Trump bucked decades of US foreign policy by formally recognizing Jerusalem as Israel’s capital and launching the diplomatic process to move the US embassy there from Tel Aviv. In February, the US administration announced that it would open its Jerusalem embassy in May 2018 to coincide with the 70th anniversary of Israel’s independence. Trump’s decision to move his country’s embassy, welcomed by Israel, has been condemned by many leaders and foreign ministers across the world, who have said the city’s status should be determined through negotiations between Israel and the Palestinians, who claim East Jerusalem — captured by Israel from Jordan in the 1967 Six Day War — as their capital. A short while after Zeman’s speech — in which he failed to say when exactly the embassy would move to Jerusalem — the Czech Foreign Ministry issued a statement clarifying Prague’s policy. The statement recalls that the Czech government last year, shortly after the US move, recognized the city’s Western part as Israel’s capital. “It thus only acknowledged what is standard practice by other States when making their official visits to Israel,” Wednesday’s statement read. “According to usual diplomatic practice, States have their embassies in the capitals of the receiving States. This is why the Czech Republic has decided, as a first step, to open an honorary consulate (led by Honorary Consul Mr. Dan Propper) in May and a new Czech Center by the end of this year, both in West Jerusalem. The statement goes on to note the longstanding friendship between the two peoples, pointing that Czechoslovakia opened a Consulate General in Jerusalem in the 1920s, when it was still the British Mandate. “The Czech Republic will go on striving for Jerusalem to remain an open city where people of different faiths can practice their beliefs freely. To make the city of Jerusalem a place of tolerance and understanding remains our ultimate goal,” the statement concludes. It does not mention the country’s embassy or any plans to move it from Tel Aviv to Jerusalem. Despite this clarification, many leading Israeli politicians rushed to issue congratulatory statements. In his speech, Zeman — a longtime ally of Israel — mentioned that he called for moving the Czech embassy to Jerusalem four years ago, joking that Trump was merely copying him. 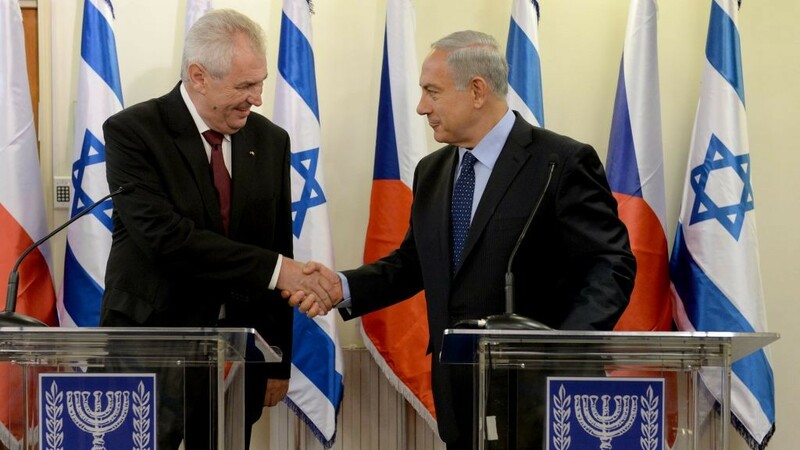 “The president of the Czech Republic is a great friend of Israel and the Jewish people and has always seen Jerusalem as the capital of the Jewish people,” Israel’s Ambassador in Prague, Daniel Meron, told The Times of Israel in a telephone interview Wednesday evening.